Normal wall outlets are great and all, but ones with integrated USB ports can be very handy. 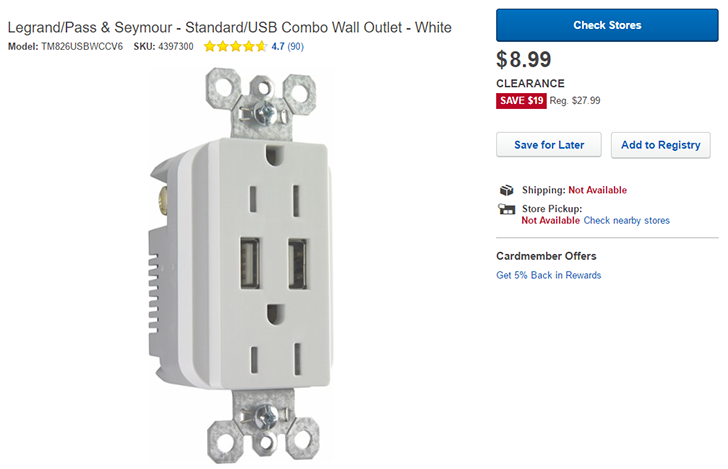 If you feel like breaking out the screwdriver and upgrading the plugs in your home, you can grab the Legrand/Pass & Seymour wall outlet with USB ports for $8.99 - a whopping $19 off the original price. Both the USB ports provide a total of 3.1 amps of charging capacity, so this should be able to charge larger devices like tablets just fine. However, these ports are not specifically designed for Qualcomm QuickCharge or any other proprietary charging standard. Also, there is no shipping available on this item - you'll have to see if your local Best Buy store has it in stock.